"Flatlands" redirects here. For the Canadian community, see Flatlands, New Brunswick. Flatlands is a neighborhood in the southeast part of the borough of Brooklyn in New York City. 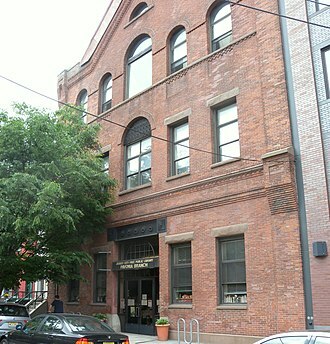 The area is part of Brooklyn Community Board 18. Originally an independent town, Flatlands became part of the City of Brooklyn in 1896. The current neighborhood borders are roughly defined by Avenue H to the north, Avenue U to the south, Ralph Avenue to the east, Flatbush Avenue to the southwest and Nostrand Avenue to the northwest. Flatlands was originally known as Nieuw Amersfoort, after the Dutch city of Amersfoort, and was established as a farming community in 1636 when Wolfert Gerritse Van Couwenhoven and Andries Hudde purchased 15,000 acres of land centered on what is now the intersection of Kings Highway and Flatbush Avenue. Though the area was purchased from Lenape Native Americans, there is no definitive evidence that the area was actually inhabited by them, as the notion of land ownership in Lenape culture differed substantially from that of Europeans and they may have been a transient population. 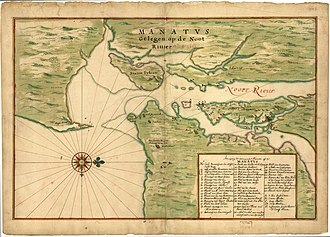 Flatlands was given the right to local rule in 1661 by Peter Stuyvesant as one of the five Dutch Towns on Long Island. 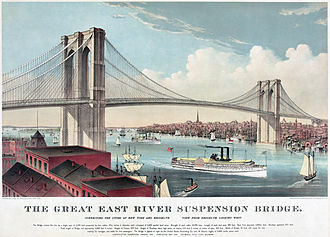 The town’s growth and development came late, largely due to the lack of a transit system or set of roads connecting it with other parts of Brooklyn. Flatlands was annexed by the city of Brooklyn in 1896. Crops typically grown in the area were beans, corn, marsh hay, squash, potato bean and tobacco. Oysters and clams were also farmed and harvested from Jamaica Bay, surrounding marshes and basins. The land-controlling families of Nieuw Amersfoort also kept black slaves to work their farms until the state declared emancipation of all slaves in 1827, after which black laborers took up farming jobs, many times on the farms they worked on as slaves. Historic homes dated to the 18th century include the Stoothoff-Baxter-Kouwenhaven House and Joost Van Nuyse House. Other historic structures are the Hendrick I. Lott House (East 36th Street between Fillmore Ave and Ave. S, built around 1720), which was a stop on the Underground Railroad, and the Flatlands Dutch Reformed Church, founded by Steven Coertse van Voorhees. Based on data from the 2010 United States Census, the population of Flatlands was 64,762, a decrease of 1,964 (2.9%) from the 66,726 counted in 2000. Covering an area of 1,249.32 acres (505.58 ha), the neighborhood had a population density of 51.8 inhabitants per acre (33,200/sq mi; 12,800/km2). The racial makeup of the neighborhood was 18.2% (11,793) White, 66.3% (42,935) African American, 0.2% (158) Native American, 4.0% (2,577) Asian, 0.0% (16) Pacific Islander, 0.5% (334) from other races, and 1.8% (1,196) from two or more races. Hispanic or Latino of any race were 8.9% (5,753) of the population. Household income is $75,949, almost $13,000 higher than the average total income for Brooklyn. The main shopping streets in Flatlands are Utica Avenue, Flatbush Avenue, Avenue N, and Ralph Avenue. Residents also commonly shop at the nearby indoor mall, Kings Plaza, located by the borders of Flatlands and Marine Park, while being across the water to Mill Basin. No New York City Subway service runs into Flatlands. However, many residents live within walking distance of the IRT Nostrand Avenue Line (2 and ​5 trains) which terminates at the junction of Flatbush and Nostrand Avenues; others use buses to get to the BMT Brighton Line (B and ​Q trains) or the BMT Canarsie Line (L train). Local and express buses are also used as a means of travel in and around the area. As of June 2013[update], the buses that serve Flatlands are the B2, B3, B6, B7, B9, B41, B44, B44 SBS, B46, B46 SBS, B47, B82, B82 SBS, B100, B103, BM1, BM2, Q35. Chris Mullin (born 1963), former NBA basketball player, was born and raised in Flatlands. Neil Bogart, founder of Casablanca Records, was raised in the Glenwood Houses project in Flatlands. Wolfert Gerritse Van Couwenhoven (1579-1662), New Netherland colonist and the original patentee. ^ Kilgannon, Corey (2007-11-01). "Dutch Deed Fetches More Than a Handful of Beads". City Room. Retrieved 2018-05-16. ^ Table PL-P5 NTA: Total Population and Persons Per Acre - New York City Neighborhood Tabulation Areas*, 2010, Population Division - New York City Department of City Planning, February 2012. Accessed June 14, 2016. Fort Beversreede was a Dutch-built palisaded factorij located near the confluence of the Schuylkill River and the Delaware River. It was an outpost of the colony of New Netherland, which was centered on its capital, New Amsterdam, the exact location of the fort is uncertain. A1655 Swedish map shows it on the west bank of the Schuylkill River, on Providence Island, scharf & Westcott put it on the east bank of the Schuylkill River, opposite Minquas Creek. A 1770s map of Philadelphias naval defenses shows a fort on the island, directly adjacent to the fort was the terminus of the Great Minquas Path, an 80-mile trail from the Susquehanna River to the Schuylkill River. This was the trade route for furs from the Susquehannock people. Though never recognized by the Dutch, the Delaware Valley region was effectively under control of the Swedish colony of New Sweden, which was first settled in 1638 at Fort Christina. Though the Swedes colony included Dutch residents, the only official Dutch presence in the area was across the Delaware River at Fort Nassau, in 1642, members of the Connecticut Colony attempted to settle in the area, but their homes were burned and the nascent colony was repelled. Fort Orange was the first permanent Dutch settlement in New Netherland, the present-day city of Albany, New York developed at this site. It was built in 1624 as a replacement for Fort Nassau, which had built on nearby Castle Island and served as a trading post until 1617 or 1618. Both forts were named in honor of the Dutch House of Orange-Nassau, after conquest of the region by the English, they soon abandoned Fort Orange in favor of a new fort, Fort Frederick, constructed in 1676. 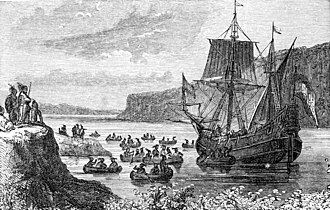 In 1624, a ship with 30 Protestant Walloons landed in New Netherland,18 of the men were sent to the location near present-day Albany, the Walloons were recalled south to settle New Amsterdam. A1628 publication on the population of New Netherland stated that there are no families at Fort Orange and they keep five or six and twenty persons, there. The Dutch party was ambushed and three men were killed approximately a mile from the fort, roughly where Lincoln Park and Delaware Avenue are sited today, whereas settlement would be through the purchase of land from the Native Americans, the Dutch built Fort Orange without any consent. They continued to hold it only through the goodwill of the Mahican, and this land patent was interpreted by van Rensselaer as including Fort Orange and the settlement that had begun outside its walls. He began purchasing and acquiring title to the lands from the Mahican, in 1630, Gillis Hoosett purchased in van Rensselaers name the lands to the south and north of the fort from the natives. Later in 1630 the first permanent Dutch settlers and farmers came to Fort Orange and settled on the outskirts of the fort, their village was first called the Fuyck and Beverwyck. In 1634 the commander of Fort Orange ordered Harmen Meyndertsz van den Bogaert west into the Mohawk Valley and Indian country, the trip lasted six weeks and took Bogaert and his men through a number of Mohawk villages and into Oneida villages, at least 100 miles from the fort. 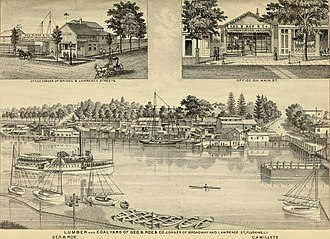 This journey was recorded in van den Bogaerts daily journal which is titled, A Journey into Mohawk and Oneida Country. In the 1640s a French Jesuit priest and missionary, Isaac Jogues, described Fort Orange as a little fort. built of stakes. In 1648, dispute arose between agents of the Dutch West India Company and agents of the patroon over control of Fort Orange, several confrontations arose over the status of the fort and the rights of settlers around it. Stuyvesant at first ordered all buildings within cannon shot of the fort to be destroyed, in response, the patroons agent, Commander van Schlechtenhorst, decided to expand settlement to within pistol shot of Fort Orange. After the yearly freshets had damaged much of the fort, the West India Company decided to reconstruct the fort using stone. In response, van Schlechtenhorst declared it illegal for anyone to quarry stone within Rensselaerswyck for the fort or for anyone to sell the material to the forts commander, all material for the fort had to be shipped in from outside the colony. In 1651, Stuyvesant declared the jurisdiction of the fort to extend 600 paces around the fort, thereby severing it from Rensselaerswyck, he appointed Johannes Dyckman as commissary of Fort Orange. Jan Martense Schenck, arrived in New Netherlands on June 28,1650, on the ship De Valckenier with his sister Annetje and brother Roelof. He bought a parcel of land on Molen Eylandt in the Dutch town of Nieuw Amersfoort in what is now the Mill Basin section of Brooklyn, New York. He purchased the land with a grist mill on it from Elbert Elbertse Stoothoff who had arrived in Nieuw Amsterdam in 1637 aboard the Vrede, the land was half of a tract Stoothoff purchased from Englishmen John Tilton Jr. and Samuel Spicer. John Tilton Jr. formerly resided in Lynn, due to his Anabaptist beliefs he along with his wife were among the colonists of Gravesend. Tilton and Spicer had bought the land from the Canarsie Indians on May 13,1664, Dutch efforts to establish the colony of New Netherland brought significant population change to the area we today call Brooklyn. When the Dutch arrived in the early 1600s, the area was inhabited by the Canarsie, the Canarsie had resided here for thousands of years and called the area where Jan Martense Schenck settled Keskateuw. Between the 1630s and the 1680s, conflict and disease decimated the local Canarsie population, according to Schenck family tradition, Jan Martense Schenck, the man who built this house, arrived in New Netherland in 1650. He is first documented in Flatlands in 1660, on December 29,1675, he purchased the land on which he built the house, along with a half interest in a nearby gristmill. The house was probably in place by 1675, the Schenck family owned the house for three generations, finally selling it in 1784. Beginning in the 1920s, as development increased, a number of preservation plans that might have maintained the house on site were put forward but were never realized. Finally in 1952, the Brooklyn Museum made a commitment to save the house, dismantled it, the house was opened to the public in 1964. The house originally stood in the town of Flatlands, one of six towns that were to become the borough of Brooklyn. 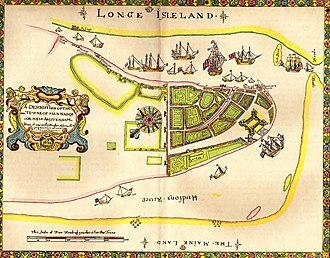 Established under the Dutch colony of New Netherlands, which became the English colony of New York in 1664, Flatlands was first called New Amersfoort, the area was originally inhabited by the Carnarsie Indians. Peter Stuyvesant served as the last Dutch director-general of the colony of New Netherland from 1647 until it was ceded provisionally to the English in 1664, after which it was renamed New York. He was a figure in the early history of New York City. 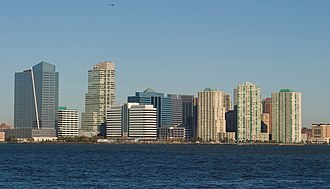 Stuyvesants accomplishments as director-general included an expansion for the settlement of New Amsterdam beyond the southern tip of Manhattan. 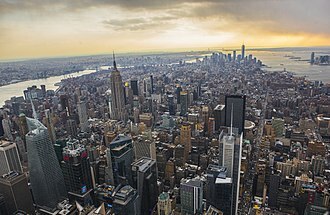 Among the projects built by Stuyvesants administration were the protective wall on Wall Street, the canal that became Broad Street, Stuyvesant was born in 1610 in Peperga, Friesland, in the Netherlands, to minister Balthasar Stuyvesant and Margaretha Hardenstein. He grew up in Peperga and Berlicum and he studied languages and philosophy in Franeker, and joined the West India Company about 1635, and was director of the Dutch West India Companys colony of Curaçao from 1642 to 1644. In April 1644, he attacked the Spanish-held island of Saint Martin and he returned to the Netherlands for convalescence, where his right leg was replaced with a wooden peg. Stuyvesant was given the nicknames Peg Leg Pete and Old Silver Nails because he used a wooden stick studded with silver nails as a prosthesis. 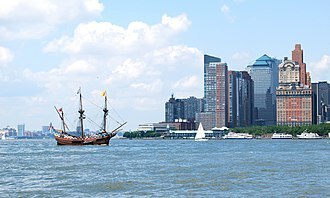 A year later, in May 1645, Stuyvesant was selected by the Dutch West India Company to replace Willem Kieft as Director-General of the New Netherland colony and he arrived in New Amsterdam on May 11,1647. In September 1647, he appointed a council of nine men as representatives of the colonists on New Netherland. He married Judith Bayard of the Bayard family in 1645 and her brother Samuel was the husband of Stuyvesants sister Anna. Petrus and Judiths first son, Balthasar Lazarus, settled in the West Indies and their second son, Nicolaes Willem Stuyvesant, first married Maria Beeckman, daughter of Willem Beeckman, and subsequently Elisabeth Slechtenhorst. In 1648, a conflict started between him and Brant Aertzsz van Slechtenhorst, the commissary of the patroonship Rensselaerwijck, which surrounded Fort Orange, Stuyvesant claimed he had power over Rensselaerwijck despite special privileges granted to Kiliaen van Rensselaer in the patroonship regulations of 1629. 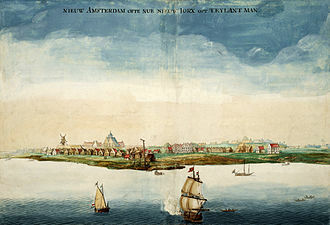 When Van Slechtenhorst refused, Stuyvesant sent a group of soldiers to enforce his orders, the controversy that followed resulted in the founding of the new settlement, Beverwijck. Stuyvesant became involved in a dispute with Theophilus Eaton, the governor of English New Haven Colony, the border was arranged to the dissatisfaction of the Nine Men, who declared that the governor had ceded away enough territory to found fifty colonies each fifty miles square. 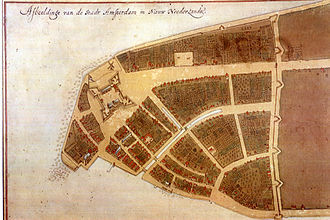 Stuyvesant threatened to dissolve the council, a new plan of municipal government was arranged in the Netherlands, and the name New Amsterdam was officially declared on 2 February 1653. Stuyvesant made a speech for the occasion, saying that his authority would remain undiminished, petrus was ordered to the Netherlands, but the order was soon revoked under pressure from the States of Holland and the city of Amsterdam. Stuyvesant prepared against an attack by ordering the citizens to dig a ditch from the North River to the East River and to erect a fortification. As many as several hundred farmed the Harlem flatlands. The first European settlement in the area was by siblings Hendrick and Rachel de Forest, in 1639 Jochem Pietersen Kuyter established the homestead named Zedendaal, or Blessed Valley, stretched along the Harlem River from about the present 127th Street to 140th Street. The settlement was named Nieuw Haarlem, after the Dutch city of Haarlem, the Indian trail to Harlems lush bottomland meadows was rebuilt by black laborers of the Dutch West India Company, and eventually developed into the Boston Post Road. The British tried to change the name of the community to Lancaster, but the name never stuck, the Dutch took control of the area again for one year in 1673. The village grew slowly until the middle 18th century. Only the Morris-Jumel Mansion survives from this period, Harlem played an important role in the American Revolution. 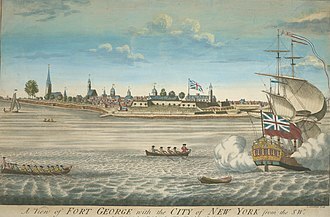 The British had established their base of operations in lower Manhattan, from Harlem, he could control the land routes to the north, as well as traffic on the Harlem River. The New York Provincial Congress met in White Plains, as did the convention drafting the constitution for New York State and it was Washingtons first American victory. 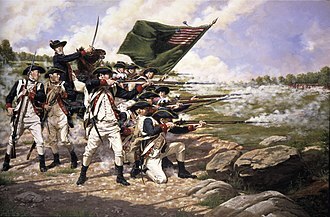 Later that year, the British would avenge this defeat by chasing Washington and his troops north, turning back, rebuilding took decades, and infrastructure was improved much more slowly than was happening in New York City proper. The 1811 report that accompanied the Commissioners Plan of 1811 noted that it was improbable that the north of the Harlem Flat will be covered with houses. Though undeveloped, the area was not poor, Harlem was a synonym for elegant living through a good part of the nineteenth century. The village remained largely farmland estates, such as Van Keulens Hook, bordered north of the Mill Creek, which flowed into Harlem Lake, to the farm of Morris Randall, northwest on the Harlem River, and westward to the Peter Benson, or Mill Farm. This branch of the Roosevelt family subsequently moved to the town of Hyde Park, as late as 1820, the community had dwindled to 91 families, a church, a school, and a library. Peter Minuit, Pieter Minuit, Pierre Minuit or Peter Minnewit was a Walloon from Wesel, in present-day North Rhine-Westphalia, part of the Duchy of Cleves. He was Director of the Dutch colony of New Netherland from 1626 until 1631 and he founded the Delaware colony in the early 1600s. His father, died in 1609 and Peter took over management of the household, Peter Minuit had a good reputation in Wesel, attested by the fact that he was several times appointed a guardian. He assisted the poor during the Spanish occupation of 1614–1619, Peter Minuit married Gertrude Raedts on August 20,1613. From a wealthy family, Gertrude probably helped Peter Minuit in establishing himself as a broker, what products he dealt in is not known. That it involved diamonds is derived from a document, a will, drawn up in 1615. By 1624, the city was in a decline and in 1625 he had left Wesel and like others went to Holland. He returned in the year, and in 1626 was appointed the new director of New Netherland. 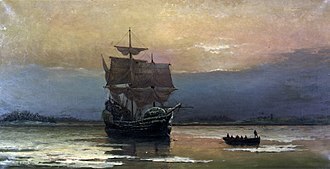 He sailed to North America and arrived in the colony on May 4,1626, Minuit is credited with purchasing the island of Manhattan from the Native Americans in exchange for traded goods valued at 60 guilders. 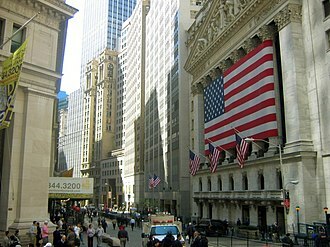 In 1846, New York historian John Romeyn Brodhead converted the figure of Fl 60 to US$23, variable-rate myth being a contradiction in terms, the purchase price remains forever frozen at twenty-four dollars, as Edwin G. Burrows and Mike Wallace remarked in their history of New York. Sixty guilders in 1626 was valued at approximately $1,000 in 2006, based on the price of silver, Straight Dope author Cecil Adams calculated an equivalent of $72 in 1992. According to researchers at the National Library of the Netherlands, The original inhabitants of the area were unfamiliar with the European notions and definitions of ownership rights, for the Indians, water and land could not be traded. Such exchanges would be difficult in practical terms because many groups migrated between their summer and winter quarters and it can be concluded that both parties probably went home with totally different interpretations of the sales agreement. The calculation of $24 fails to recognize that the concepts of property trading and ownership held by the 17th-century Dutch, comparisons to modern land dealing distort the reality of what Minuit was trying to do.